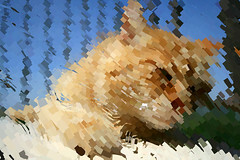 A series of vector-graphic images generated from pet photographs found on Flickr. 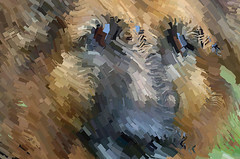 These painterly images document the love and obsession that people express for their pets ... in the form photographs uploaded to the Flickr website. 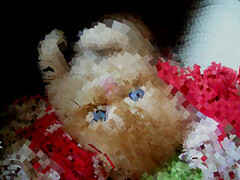 For this project, I collected pictures of dogs, cats, puppies (clearly, a different species than dogs), kittens, hamsters, and bunnies on Flickr.com and generated new images based on the features and colors of the originals. 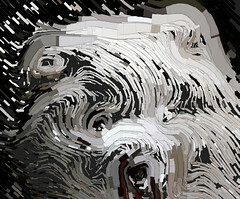 These high resolution images, which share a likeness to Gustav Klimt's work, are still images taken from animations that were made in C++ using OpenFrameworks. 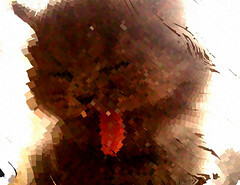 Cat Faces at Fictilis Gallery. Seattle, WA. January 2012. ITP Spring Show. New York University. New York, NY. May 2008. 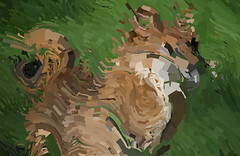 Cuteness, obsession, pets, vector graphics, gesture, form, vector fields, prints.